Notary seal stamp for California notaries. High quality pre-inked stamp makes a sharp, clear impression. Required in CA. Good for up to 50,000 impressions. Refill with Brother ink ONLY. You must mail us your original "certificate of authorization to manufacture notary public seals" form. 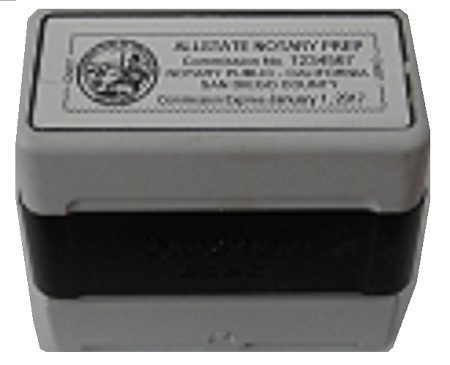 We need to stamp that form with your notary stamp before we can send the stamp to you. Our Mailing Address: Bluewater Surety Insurance Agency, PO Box 191404, San Diego, CA 92159. Please Do Not send your seal certificate "Certified Mail" or anything that is "Signature Required" as this will delay your order. Regular mail or Priority Mail work fine. UPS and FedEx do not deliver to a PO Box. We do not make notaries seals for states other than California.